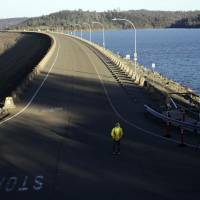 OROVILLE, CALIFORNIA - Crews working around the clock atop the crippled Oroville Dam have made progress repairing the damaged spillway, reducing the lake level by at least 8 feet overnight at a Northern California reservoir that has been central to the life of the towns around it for a half century. 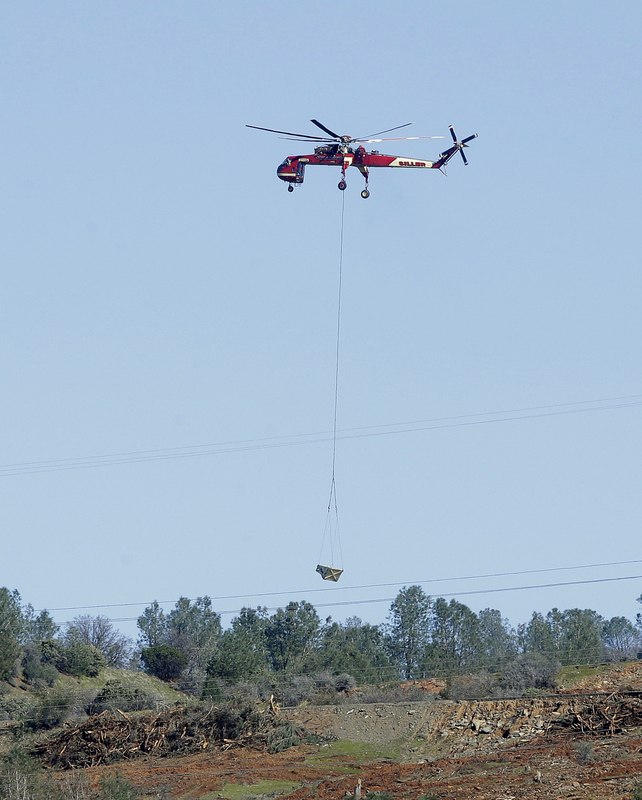 Workers hoisted giant white bags filled with rocks, and at least two helicopters planned to fly in rocks Tuesday then release them into the eroded area of the spillway. Dump trucks full of boulders also were dumping cargo on the damaged spillway. 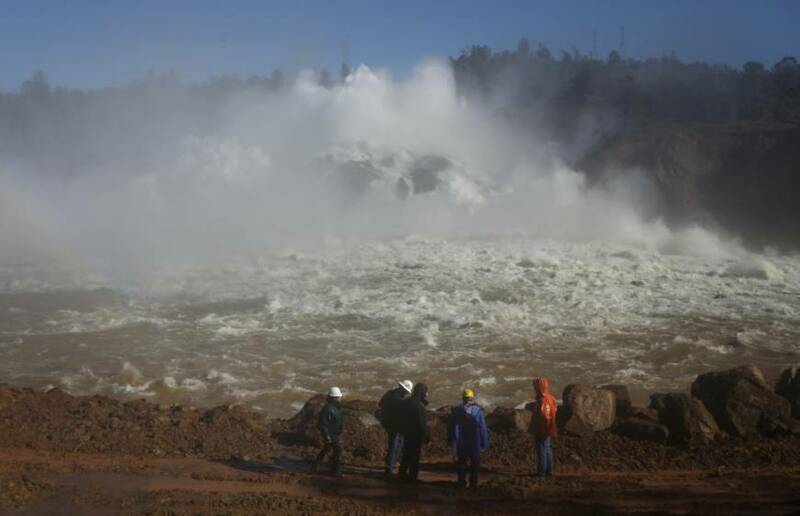 Workers are rushing to repair the barrier at the nation’s tallest dam after authorities ordered the evacuation of nearly 200,000 people for everyone living below the lake amid concerns the spillway could fail and send water roaring downstream. Evacuations remain in place. 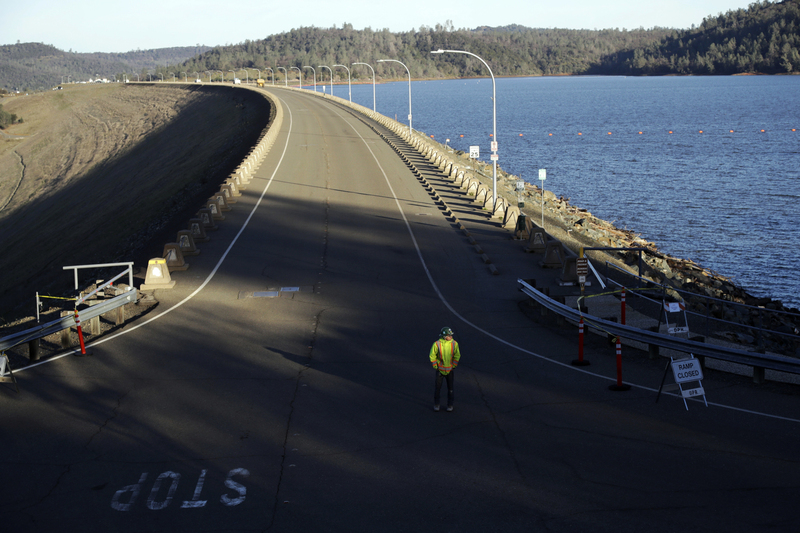 State Department of Water Resources officials hope to reduce the lake level to 860 feet by Thursday when storms will bring more rain, spokesman Chris Orrock said. The level was 884 feet on Tuesday morning. The lake that for five decades has brought residents holiday fireworks and salmon festivals now could bring disaster. 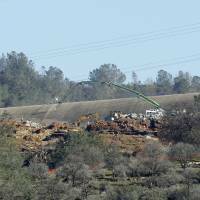 “Never in our lives did we think anything like this would have happened,” said Brannan Ramirez, who has lived in Oroville, a town of about 16,000 people, for about five years. The Gold Rush town in the Sierra Nevada foothills some 70 miles northeast of Sacramento is nestled near the foot of the dam, which was completed in 1968 and at 770 feet is the nation’s tallest. Houses and churches are perched on tree-lined streets near the Feather River. Old, ornate Victorian homes sit alongside smaller bungalows. Local businesses, including one that sells supplies for gold-panning, dominate a downtown area that spans several blocks. A wide range of chain stores sit a short distance away along the main highway. Cities and towns farther down the Feather River also are in danger. Yuba City, population 65,000, is the biggest city evacuated. The city has the largest dried-fruit processing plant in the world and one of the largest populations of Sikhs outside of India. 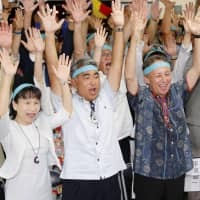 The region is largely rural and its politics dominated by rice growers and other agricultural interests, including orchard operators. The region is dogged by the high unemployment rates endemic to farming communities. There are large pockets of poverty and swaths of sparsely populated forests, popular with anglers, campers and backpackers. For now, it’s all at the mercy of the reservoir that usually sustains it, and provides water for much of the state. “If anything, we would have thought that the dam would have been constructed better,” Ramirez said. 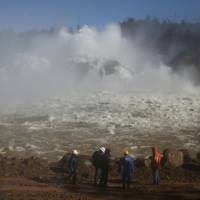 Over the weekend, the swollen lake spilled down the unpaved, emergency spillway, which had never been used before, for nearly 40 hours, leaving it badly eroded. 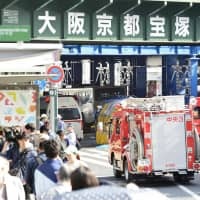 Officials defended the decision to suddenly call for mass evacuations late Sunday afternoon, just a few hours after saying the situation was stable, forcing families to rush to pack up and get out. Brown has had harsh words for President Donald Trump, and the state has vowed to resist many of his administration’s efforts. The governor said he doesn’t plan to go to Oroville and distract from efforts, but he tried to reassure evacuees. “My message is that we’re doing everything we can to get this dam in shape and they can return and they can live safely without fear,” Brown said. Authorities later lifted an evacuation order Tuesday for nearly 200,000 California residents who live below the nation’s tallest dam after declaring the risk of catastrophic collapse of a damaged spillway had been significantly reduced. 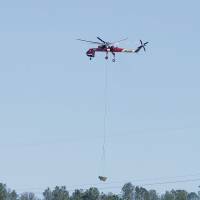 Residents returning home “have to be vigilant,” and “there is the prospect that we will issue another evacuation order … if the situation changes,” the sheriff said. Over the weekend, the swollen lake spilled down the unpaved emergency spillway for nearly 40 hours, leaving it badly eroded. 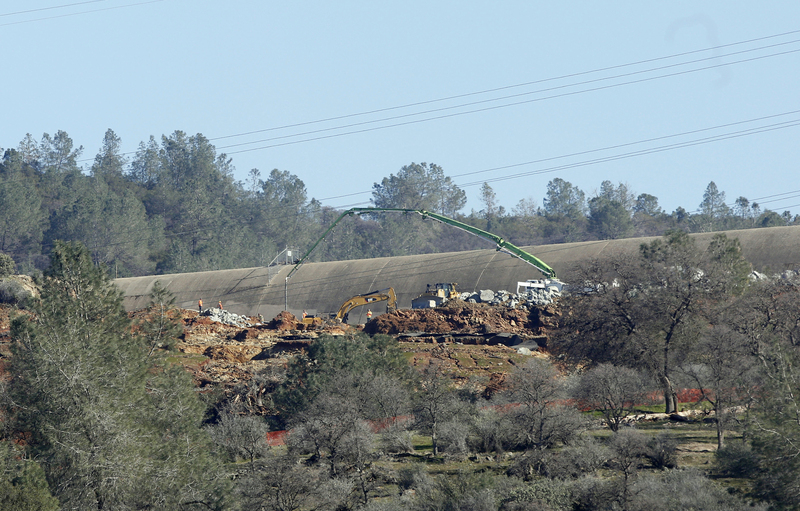 The problem occurred six days after engineers discovered a growing hole in the dam’s main, concrete spillway.